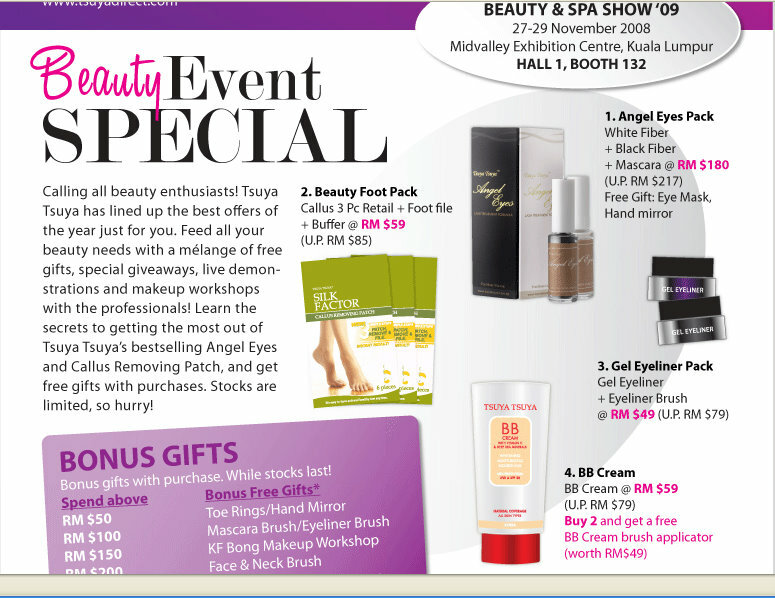 Tsuya-Tsuya is having their Beauty Event Special in the coming weekend of 27-29th November 2009, in conjunction with the Beauty & Spa Show 2009. In conjunction with the Beauty & Spa Show, Tsuya- Tsuya will be having 3 workshops each day over the weekend (27th - 29th November). Each workshop can hold between 15-20 participants. Make-up Artist KF Bong, finalist of Shu Uemura Beauty Art Make-up Competition from the year of 2006 to 2008, will be conducting the workshop. His clients have included Tommy Hillfeger, DKNY, Nine West, and etc. The entrance to the workshop is either through purchase of RM35 voucher from their booth (Hall 1, No.132) which is fully redeemable for products, or with purchases of RM150 at their booth. 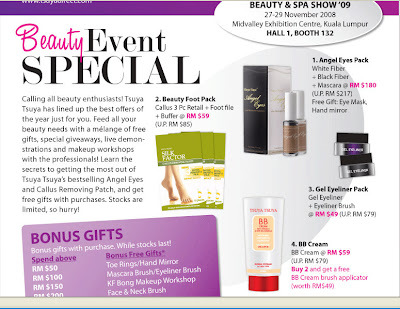 However, readers of The Beauty Regime will be able to attend the workshop for free*! Tsuya-Tsuya has been kind to provide free entrance to the first 10 persons to sign up for the assigned workshop on Friday (27th November- Hari Raya Korban) under The Beauty Regime. The first 10 readers will also be assigned door-gifts!! harlo.. it seems that this entry has automatically been-- linked by my blog settings. LOL. R u going to join this workshop? i remember u mentioned tsuya tsuya to me? where's the brand from? i'm curious!! so its a Penangite-Singapore-Korean product. oh seriously? i've never seen it at any counters though. maybe i never take notice.